Given 2,000 pages, 7 major texts, 32 dramatic pieces, plays, 30 poems, 3 early stories, an early story collection, 20 more stories to total 52, texts, novellas, 3 pieces of criticism: What can one add? This brief review surveys instead the value-added, the perceived advantages of this slipcased, four-volume compendium. However, as series editor Paul Auster explains in the only commentary within all these pages, a six-paragraph preface: “the works on which Beckett’s reputation rests” are all here. This collection duplicates, at first glance, the hardcover editions (if with different artwork), commemorating the 2006 centenary of the author’s birth. They appeared in a limited (and soon sold-out as a tetralogy) press run. Therefore, I opened these paperbacks expecting to find the same contents in a more affordable version. The press blurb for the box-set of these Grove Centenary Editions noted: “Typographical errors that remained uncorrected in the various prior editions have now been corrected in consultation with Beckett scholars C. J. Ackerley and S. E. Gontarski.” I assume these texts have been reprinted in paperback unaltered. This may be of passing interest to casual readers (if any exist for Beckett), but a few, especially in academia or who conduct research upon this most dazzling of modern authors—who succeeded at fiction, drama, poetry, and criticism equally, and in two languages—may need to know this notation. Earlier printings of Beckett’s work, often published in the United States by Grove, suffered from textual errors. Therefore, the scholarly community and the theatrical performers who energize Beckett may welcome these handsome volumes, designed in paperback with bold photos by Laura Lindgren, who created for the hardcovers minimal icons; these decorate the back of the paperbacks. Unfortunately, Grove-Atlantic has not kept the introductions by noted contemporary writers that graced the hardcover versions. With more than a couple thousand pages already, why a few more could not be spared for these essays puzzles me. Colm Tóibín had introduced the earlier and Salman Rushdie the later novels; J. M. Coetzee had discussed the poems, short fiction, and criticism. Edward Albee prefaced Beckett’s drama. The loss of these contributions weakens the impact of this paperback set. However, the abundance of what remains, Beckett unfiltered, direct, and freed from interpretative templates or critical constraints, proves welcome. Instead of many small volumes of many of these works, a reader may purchase this collection and have nearly all of what Grove-Atlantic keeps in print in one convenient container, rather than a small shelf of paperbacks, as most readers of Beckett had to accumulate over the past half-century in order to read this author’s prolific productions. Even in smaller anthologies by genre, Grove-Atlantic still gathers nearly all of Beckett in eight volumes. Ultimately, the reduction of his life’s work into these four uniform volumes with handsome typefaces and readable presentation (even if not on acid-free paper, another disappointment) improve upon the less attractive fonts and galley plates used for many Grove printings when Beckett’s works began to be issued by the same press decades ago. The scholarly editions may wait, but as with his correspondence which after a quarter-century of preparation and litigation has begun to be published, delay may be a consequence of contentions between his estate and those who (as with certain dramatic productions) seek more liberty. The contents themselves have generated large rather than small shelves of reaction from critics and professors and actors themselves. Rather than adding to them here, any reader curious about this bold author, who confronts the Big Questions without Easy Answers, needs to return to the originals. 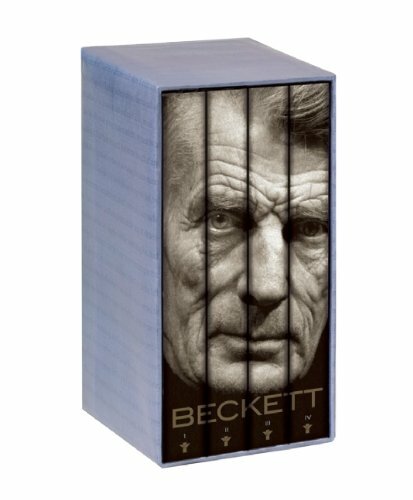 Perhaps, cleared of even the short introductions by his followers that nestle in the hardcover editions, the paperbacks present Beckett as he deserves to endure: direct, compassionate, unflinching, and brave.